Radio Active reaches a milestone with Episode #50, but it ends up being a fairly quiet birthday with news of a Nuketown road trip, a GenCon update, adventures in parenting with nosebleeds, and a summer reading list. I also run down my favorite Radio Actives from the first 50 episodes, talk about the Wicked Good Podcast, and throw out a bunch of new podcasts that I’ve queued up, but won’t have a chance listen to until I restart my third-floor painting project. I’m on the road again, this time at a Higher Education Web portal conference at Gettysburg College called “Portal 2007”. I’m also strangely without Internet connectivity because although the conference is wired (or rather, wireless, the campus room I’m staying in does not. Nor does it have a TV. Man, am I ever going to be productive this week! I mentioned last time that I was bummed I couldn’t get into any Spirit of the Century events at GenCon. Fortunately Mick Bradely from the Harping Monkey road to my rescue with a ticket. StarGirl’s been having nosebleeds for the last few months. They’re not a big deal, although they can be unnerving. What I’d all but forgotten was that I started having nosebleeds as well at her age, and had them fairly regularly until I was 8 or 9. This serves as a graphic illustration of one of the great reasons for having kids — it reminds you of what it’s like to be very young, and about everything you experience when you were younger. I’m looking for more suggestions though — I’m mostly interested in new and old space opera or hard SF, but I’ll think about fantasy and horror suggestions. I also want to know what’s on your reading list. E-mail me at nuketown@gmail.com or post a comment to the show nots. My one (and to date, only) show with a guest host. Great game, great co-host. I’d love to do more of this. 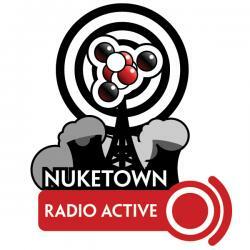 The biggest news at Nuketown these days it that Radio Active has hit episode #50 (which you know, since you’re listening to it now). Radio Active awoke from its thermonuclear slumber on March 14, 2007, and it took me a little over two years to hit Episode 50. Occasional hiatuses aside, that’s not too bad — it’s a rate of a new episode every 2-3 weeks. A husband and wife recount their misadventures in Massachusetts, made all the more amusing (and interesting) by the fact that they were expecting a baby (who was born about a month ago). Steve and Maureen (and now Rebecca, who can be heard crying in the most recent episode talk about life in New England, their trials trying to get ready for the baby, and occasional geeky topics like video games. There are a bunch of podcasts I have queued up, but just haven’t had a chance to listen to yet (but don’t you worry — the third floor painting project isn’t even half done yet).